Welcome To 2dollar Store all our products comes with Resale https://www.tradebit.com from here and sell it anywhere and make big profits or you can use for your Personal Use. How Would You Like To Sound Just Like A Professional News Anchor The Next Time You Create Your Own Podcast Without Having To Have The Budget Of A TV Network?" If if you are creating audio podcasts for your professional web site, you don't want to sound umm like ughh a dork that can't remember what the heck umm they are trying to ughh say! Do it like a real PRO with "Podcast Assistant In A Box" starting today! Podsasts are a pretty incredible new technology, arent they? Oh, THAT was impressive. Yeah, right. Like Id want to send that out over a podcast to my customers, with all the ums and ahs. No way, Jose. Imagineyou do your podcast, talking just like you normally do without having to be self-conscious or think about what to say. Then you use a simple tool to smooth it all out so it sounds like a pro recorded it. Finally! A way to quickly and easily make every podcast you make sound just like Anderson Cooper on CNN or someone like him recorded it. If you have always wanted to be able to quit your day job and break into the Internet Marketing world podcasting is a great way to do it! What kind of podcasts could you make with "Podcast Assistant In A Box"? Well, first lets look at what it would cost you to have your podcasts edited by a sound engineer. If you make 10 podcasts, thats $1,500. So even if I sold "Podcast Assistant In A Box" for $1,500, it would pay for itself after 10 podcasts. If I sell a certain number of "Podcast Assistant In A Box" cheap, then people will talk. Bottom line: if you want "Podcast Assistant In A Box" at the low price of $10.00, youd better ACT NOW! 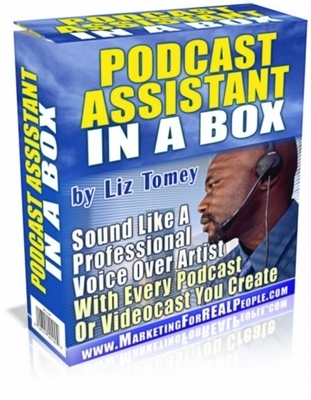 You Really Cant Afford Not To Invest In These "Podcast Assistant In A Box"
It's easy to get started right away. Just click the order link below, and get yourself ready to rock the world with awesome podcasts! Special offer: Would you like to have resell rights to the "Podcast Assistant In A Box"? You'll be able to sell the "Podcast Assistant In A Box" to your customers and keep 100 of the profits. Your resell rights come with a complete website salesletter, and professional graphics for you to promote the "Podcast Assistant In A Box" software with. You'll have your own product that you can sell to YOUR customers and keep all the profits! There is no additional charge for the resell rights. It's included in your one time payment of just $2!